NEW DELHI: The Tatas is entering airport business with GMR through a three-member consortium that is buying its 45% stake which will also help the GMR reduce its debts. 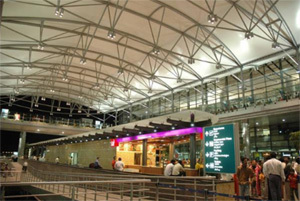 GMR Airports, the hoding company for airports, is getting funds infusion of Rs 8,000 cr from a consortium of investors that includes the Tatas making a debut in the business by putting 20%, global investors GIC 15% and SSG Cap 10%, of GMR infra stake sale. Of the Rs 8,000 cr, Rs 1,000 cr will be equity infusion (fresh share sale) and Rs 7,000 cr will be share purchase (secondary share sale). This deal will take care of GMR debts to a large extent. Apart from debt liquidation, GMR is creating a new platform for airport investment. Rs 7,000 cr may go for debt reduction, but the thrust is on the long-term investment that it is. GMR plans in due course to create an airport vertical free from infra and eneregy projects, a separate listed entity. Previous investors may be looking for exit and some of the Rs 7,000 cr may be utilised for that. Corporate debt will be wiped out completely. Total debt will go down from Rs 20,000 cr to Rs 12,000 cr effectively which sits with various projects. Post-deal, GMR group will own 54% in GMR Airports. Irrespective of investments, GMR will control the airports, although the new-comers will have board representation. GMR, moreover,will also benefit from the expertise the investors are bringing, especially GIC which has international experience.